The main page of Twitter, a leading Internet microblogging site. Twitter on Thursday began letting a small number of users test a "Lists" feature for dividing maelstroms of tweets into manageable sub-categories. Twitter on Thursday began letting a small number of users test a "Lists" feature for dividing maelstroms of tweets into manageable sub-categories. 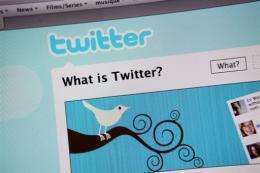 "The idea is to allow people to create lists of Twitter accounts," project lead Nick Kallen said in a blog post. "For example, you could create a list of the funniest Twitter accounts of all time, athletes, local businesses, friends, or any compilation that makes sense." Lists can be public or private, leaving open the option for users to let each other know whose Twitter commentaries they deem worth following. "Other Twitter users can then subscribe to your lists," Kallen said. "This means lists have the potential to be an important new discovery mechanism for great tweets and accounts." Twitter built the feature in response to feedback from users eager for ways to organize tweets, which are streamed together in real time torrents of terse commentary. Twitter plans to release information about the Lists software to developers so they can adapt applications to the feature. "We're just doing limited testing for now," Kallen said. "But, once we've tested the feature out a bit, we'll launch it for all accounts." Twitter, which allows users to pepper one another with messages of 140 characters or less, has grown rapidly in popularity since it was launched in August 2006 but has been unable so far to generate revenue. The San Francisco-based Internet firm claims to have topped 50 million users.